Sierra Nevada always intrigues me and of all the breweries to release seasonal beers I really look forward to the new editions to the Sierra family. This Brewery was established in the small town of Chico, California in 1979. Ken Grossman began home-brewing which flared a passion and he converted this into one of the most famous craft breweries the States have to offer. These guys have won a minimum of 4 awards every year since 1987. That's pretty impressive. The first batch of 'Pale Ale' was produced in 1980 and they've grown hugely since then with a very impressive portfolio of strange and interesting comparisons to Traditional English styles and innovative brewing experiments. 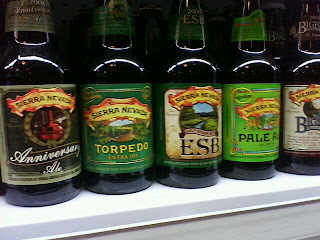 The Sierra Nevada Torpedo, extra I.P.A. Traditionally I.P.A's were brewed in England to export to the the homesick English Colonists therefore to last the distance had to be over-hopped and very high in alcohol, this brewing tradition for longevity has become a popular style, especially from American breweries. This is not similar to any other I.P.A that I've tried. On the nose it's pine cone and resin aromas with some citrus notes. The palate is grapefruit with an oily pine resin finish. The Sierra Nevada E.S.B also just arrived, clear brown colour, the nose is a little too serious for me - bread dough and hops but the palate is smooth spicy with some caramel on the finish. The Torpedo is delicious, really good hop levels, slightly sweeter than Goose Island IPA which is my go-to benchmark. Definitely up there as one of my favourite IPAs around. Cracking beers. The Anniversary Ale is particularly good. Though the whole thing about IPA being brewed strong and hoppy for the voyage to India is one of those myths that refuses to die. Hope to have the summer beer in in the next couple of weeks, I have some new Samuel Adams gear en-route. See you over the weekend. Ruth. Never let the truth stand in the way of a good story John!! !